Schoolwide PBIS can completely change your school’s climate by focusing both students and staff on positive behaviors. Your school is doing an outstanding job of implementing schoolwide Tier 1 PBIS, and you have seen improved behavior throughout your school. However, a certain percentage of your students don’t seem to be responding. Students who continue to demonstrate minor inappropriate behaviors may be candidates for your Check-In/Check-Out system for students. A great welcome is always important, with student/adult rapport being key! Personal interaction is crucial to the success of any Check-In/Check-Out system for students. Ask about their day, evening, interests, family or friends. Keep the interaction brief, quick and positive. Simply acknowledge the student for checking in or out and quickly review materials, supplies, and attitude. This short amount of time spent together should focus on language which empowers and encourages the student, even if they haven’t received the maximum number possible. Use open-ended questions which allow students to verbalize their own goals. “What went well” and “what do you want to work on today” are great ways to start a conversation. This helps establish buy-in from their perspective. Brainstorm ways to be better. To have a lasting impact, CICO can’t just be a “school” intervention. Take the time to get permission and buy-in from home. Coach parents on how to review the point sheet with their child. Make sure to stress a positive and encouraging interaction which is always part of the daily routine. 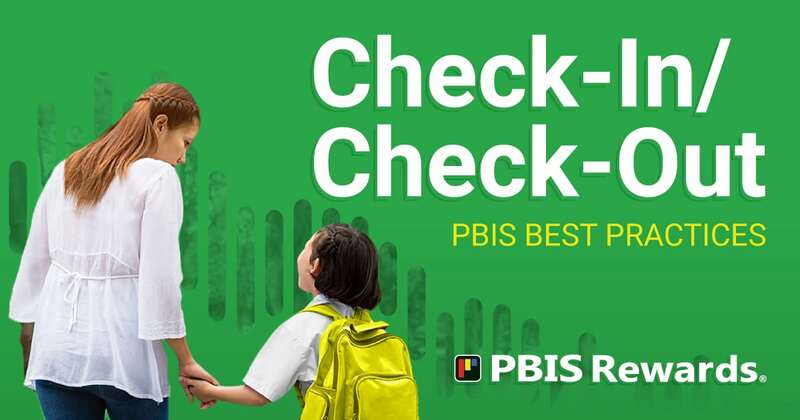 Establishing a Check-In/Check-Out team which establishes and reviews the Check-In/Check-Out PBIS system for students, as well as review the data on a weekly or bi-weekly basis is a must. The team can track, discuss, and modify the program for each student. Discuss options, including modifying goals, fading, or even graduating students from the program. It can be tempting to lose sight of the group-based element of CICO as a targeted Tier 2 intervention. While each student in CICO has individual challenges to overcome on their way to Tier 1, creating a personalized CICO plan for each needlessly complicates the process. Keep the process simple and general for the entire group. Students who are unable to progress away from CICO should be considered for individual, more intensive, Tier 3 supports. Check-In/Check-Out can be a powerful approach to helping students to develop to their fullest potential. Remember, the goal of CICO is to help students move into more general supports and catch up with their peers. Checking in with their coach at the beginning of the day will help them to be prepared for class and ready to learn. Checking out at the end of the day will help them to reflect on their successes and learn from their difficulties. Over time, the points they receive each day for meeting schoolwide expectations will indicate the progress they are making. Once they are consistently meeting their points goals, they are ready to join their peers in Tier 1. At this time you can begin their transition out of your CICO program. Implemented effectively, CICO can result in reduced problem behavior, increased pro-social behavior, and improved academic engagement within your schoolwide PBIS initiative. Ultimately, though, Check-In/Check-Out is in place to help individuals achieve greater self-confidence and success.